Last night we were scheduled to meet friends for a tasting at a new tasting room in Thousand Oaks, CA, the next town over from us. They said meet at Alma Sol, but I made it Aldabella – another brand new tasting room just opened in the area. Thus began the comedy of errors. Dorianne was judging cakes and a life cooking contest at the Ventura County Fair and was going to be a bit late getting home to make our 5:00 pm appointment. I texted our friends and let them know. They texted back that the wife in that couple was stuck in traffic and would be a bit late, too. Dorianne arrived and we shifted cars and headed for Altabella, located on Via Colinos opposite the Four Seasons Hotel in Westlake Village. Altabella Winery Tasting Room has a beautiful tasting room adjacent to a medium-sized warehouse winery. We settled in on a plush sofa and waited for our friends. We received a text that our friends’ GPS was acting up and they would be a bit later. So we sat. One of the owners noticed that we were just sitting their and ordered us glasses of their Syrah. The wine was nicely-crafted, acidic, and smoky. I liked it more than Dorianne did. Then, a phone call. “Hi, we are here, where are you?” the voice at the other end of the phone asked. “We are right here – Altabella Wine Tasting Room.” “No, came the response, Alma Sol.” So, we said our goodbyes and headed over to Alma Sol Winery Tasting Room, arriving about ten minutes later. 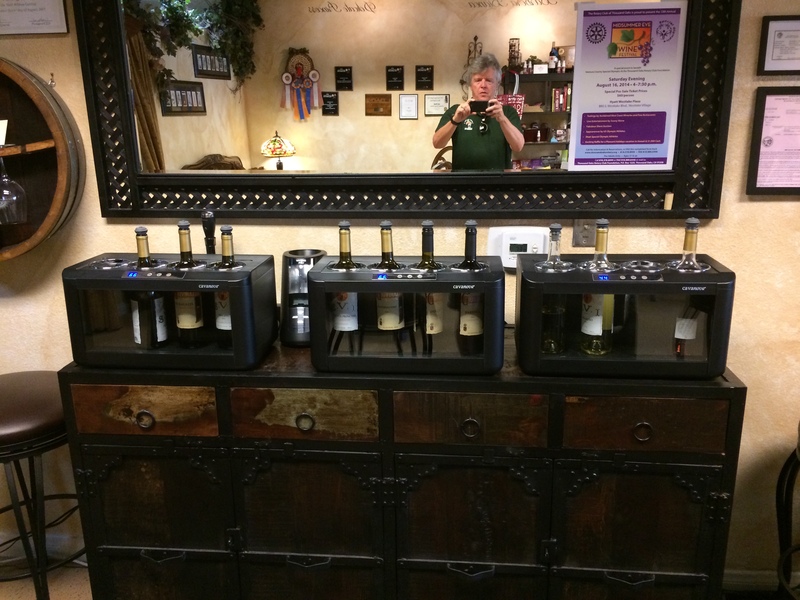 There are two winery-operated tasting rooms in the area and we each went to a different one. End of comedy of errors. We were greeted at Alma Sol by our friends, of course, and by John and Lisa Shaw, the owner-operators of Alma Sol. And then it all came back. We had met John and Lisa at the 2013 Garagiste Festival in Paso Robles, a gathering of small producers. We recalled speaking to them, enjoying their wines, and, yes, hearing that they were going to open a tasting room in Thousand Oaks. Our friends used to work with John and Lisa at Sage Publications. So, old home week. John was heading out to pour at a charity event, so he poured our first glass, a 2013 Sauvignon Blanc, chatted for a bit, and headed out. Lisa stayed with us beyond their scheduled closing time of 6:00 pm, and poured and poured and poured. 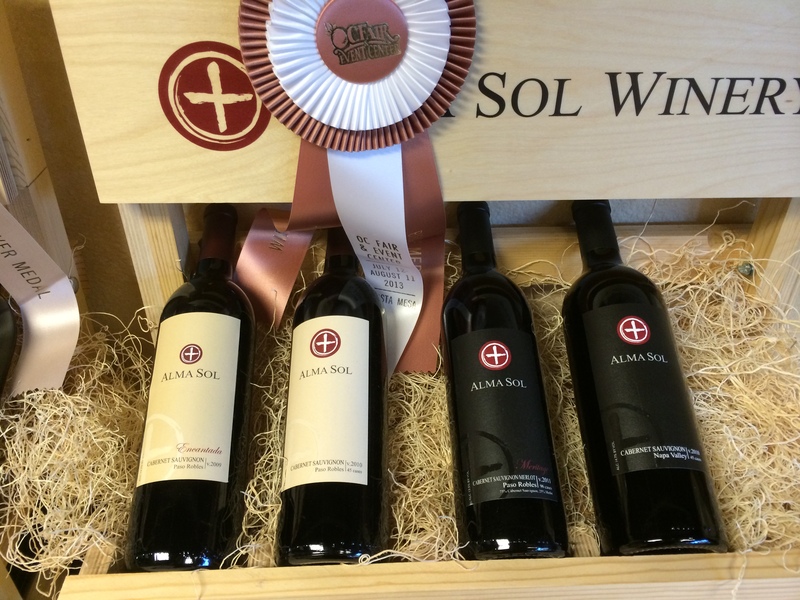 Alma Sol is their operation from top to bottom. Their Cabernet Sauvignon grapes are sourced at Lisa’s family vineyard in Paso Robles and their other varietals from a number of nearby vineyards. All of their wines are very well-crafted – you can tell the winemaker’s touch, but the essence of the fruit and the terroir are present. They are a small production winery – almost everything is well under 100 cases of production – but produce a good variety of wines within that structure. otes. It retails for $32 – a bargain. We will be visiting their tasting room, which they share with another small producer, Sunland Wines, whose wines we will taste in a future visit. They are located at 1321 E. Thousand Oaks Blvd, Suite A-108, Thousand Oaks, CA 91362.